Here’s a headset specifically for gamers. 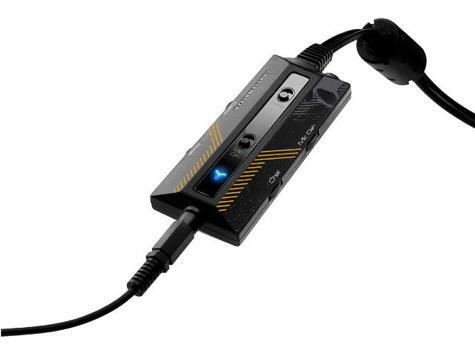 It is nearly universal as it is compatible with PCs and Macs as well as the PlayStation 3 and 4, Xbox 360, and Xbox One (also Xbox One controllers that include a headphone jack.). In addition, it can be used with with VR headsets, Nintendo Wii U, Nintendo 3DS, and PlayStation Vita. The headphones can also plug into your smartphone for listening to music and making handsfree phone calls. A detachable, very sensitive boom mic is included. 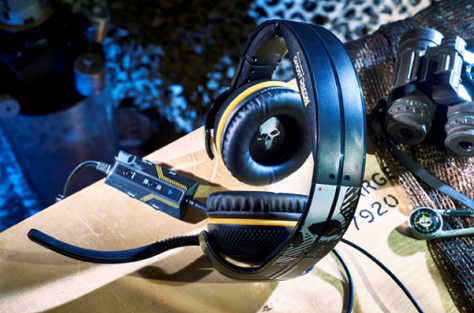 The earphones incorporate what Thrustmaster calls a “double electro-acoustic bass amplifier.” It powers 50mm drivers to produce hefty sonic realism. Games with explosions, hellfire, and brimstone are stunningly authentic. Even soft atmospheric backgrounds sound true to life. I admit to some initial skepticism about listening to music with these. I use Global Delight’s Boom 2 equalizer on my Mac. The sound quality from these headphones is delicious. The bass is a bit heavy for music, but that is easily tempered with my equalizer. The high end of the spectrum is clean and sparkly. All-in-all, the audio performance is very good. At 12.5 ounces (354g), these are not light. They are also quite big. With white skulls as decoration, they seem inappropriate for listening to Vivaldi. For gaming, however, they fit right in stylewise. 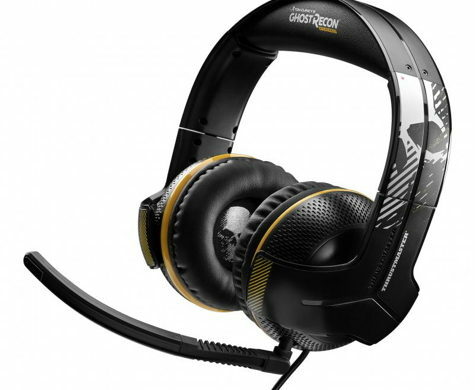 The headset has an attached 42 inch (107cm) cable with a 3.5mm audio jack at the end. It’s short because it plugs into a controller on a proprietary cable. This compact controller does many things: There is a mic on/off switch, a voice on/off switch, a game volume control, a bass control, a mic gain control, and a chat volume control. Extending from the controller is a 7 foot (210cm) proprietary cable that splits in the middle. One half has a USB plug at the end and the other half ends in two RCA plugs with by-pass sockets built in. These are for connecting to many game machines. I would have preferred two separate cables to this dual-purpose one. It’s cumbersome because the part of the cable not being used must be coiled and bundled with a Velcro strap to keep things tidy. Good sonics, sturdy build quality, an affordable price, and compatibility with most gaming systems make this headset a good choice.